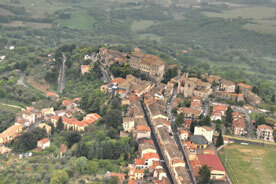 The historic center of Jupiter looks at the Tiber from the top of a hill. The early history of the village continues to be told by alleys, arches and buildings enclosed in the historical center and, above all, from the majestic Doge's Palace, the “castle”, which recalls the splendor of Lords. The origin of the name “Giove” is still shrouded in mistery. Two hypotheses have been advanced. The first relates to the pre-roman period and to the presence of a temple dedicated to the god Jove or Jupiter, the father of the gods. The second is based on the ancient name of Giove, “Juvo” or “Jugo” as written in medieval documents, tracing it back from the Latin word “jugum”, that is “obligatory route”, “peak within two valleys”, which matches perfectly the topographical features of the landscape. In Roman times numerous villas and rural settlements sprang up in the area of Giove as early as the first century B.C. 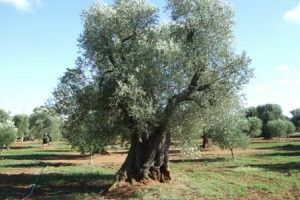 This is demonstrated by the remains of buildings and coins most of which were discovered close to the Tiber, then a navigable river and thus a favoured means of trade with Rome and the Mediterranean. The castle of Giove was first mentioned in documents dated 1191, concerning an exchange of goods between Offreduccio di Buonoconte of Alviano and Berardo Di Pietro, Lord of Giove, in which it was referred as “the castle of Juvo” described as “a well fortified area to protect the Tiber valley”. During the Middle Ages the castle of Giove was involved in the dispute between Guelphs and Ghibellines. 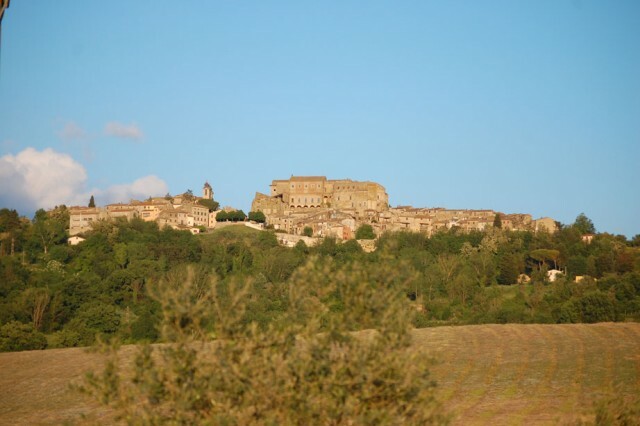 In 1220 it was occupied by the Todi Ghibellines, but only three years later submitted to the Orvieto Guelphs. The entire fourteenth century was marked by the alternating dominations of the Papacy, of Todi and Orvieto, apart from brief spells under the Anguillara, Egidio Albornoz and the Company of the Captains of Ventura called “del Cappelletto”. On 7 January 1514 Galeazzo Farnese became Lord of Giove and, in 1557 his son, Pier Bertoldo II, granted the City Statute. On 14 June 1597 Mario Farnese Di Latera sold the castle and the surroundings lands to Ciriaco and Asdrubale Mattei for 65.000 crowns. In 1638, by a papal bull of Pope Urbano VIII, Girolamo Mattei, son of Asdrubale, was nominated the first Duke of Giove. 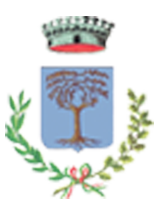 The Duchy of the Mattei was to last until 1800, when Duke Filippo Mattei was succeeded by his nephew Carlo Ludovico Canonici Mattei. During the 1900s the castle passed from the Ricciardi family to the Counts De Robilant and finally to the Dukes of Acquarone who sold the castle in 1985 to the American film producer Charles Robert Band. Since 2009 the Castle has several times been put up for auction but has not yet found a buyer.